Tie up your horse and grab a pint as you prepare to put together this 1000piece jigsaw puzzle by famed master painter Charles Wysocki. Sleepy Town Westfeatures all of the classic icons from old western movies, including a generalstore, post office and saloon. The steam engine chugging in the distance andthe presence of horses and buggies in town offer an interesting contrast intransportation and progress. 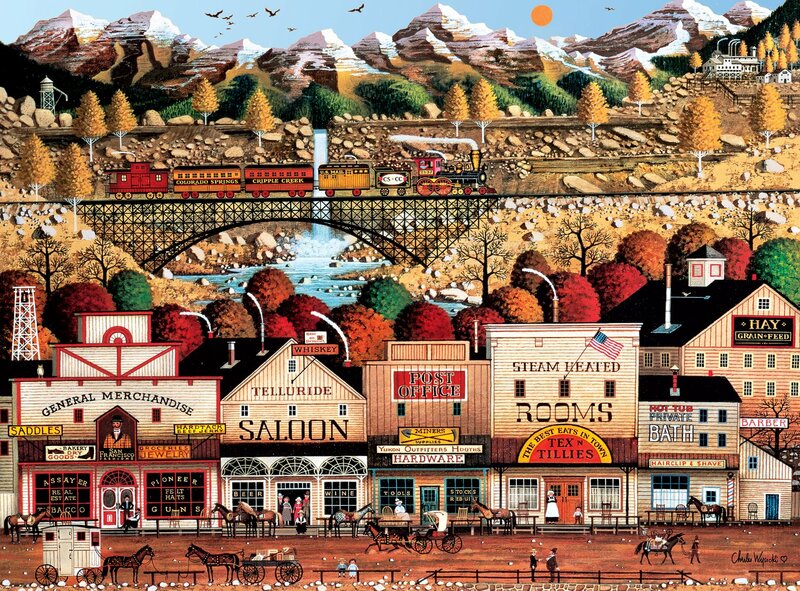 For more than 40 years, Charles Wysocki enjoyedhis love affair with life and Americana and through his imaginative andcolorful artwork, touched the hearts of millions worldwide. "Chuck" felt aspecial kinship with puzzlers, who share in the creative process by buildinghis paintings one piece at a time. Every Buffalo Games jigsaw puzzle ismanufactured in the U.S.A. from recycled puzzle board. A precision cuttingtechnique guarantees that every piece will fit soundly with the company'ssignature Perfect Snap. A bonus puzzle poster is also included so that youhave a handy reference of what the completed puzzle should look like while youput yours together.